The Albuquerque Police Department is now making local up-to-date crime data. 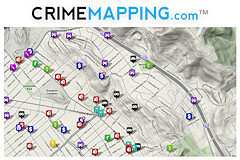 This web-based service provides neighborhood crime information to citizens within 24 hours of an incident. The information provided is obtained from calls for service handled by the Albuquerque Police Department. Community members can access this information for free thus empowering them to make informed decisions to help improve the safety of their families, friends, property and the community at large. Download a presentation file for Albuquerque Crime Statistics for Mid-year 2018.